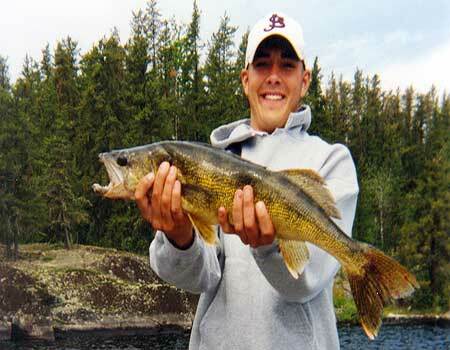 Hidden Lake provides the finest 4 Star fly-in fishing Canada has to offer. Your cabin is 24×41 feet with plenty of room for your group. 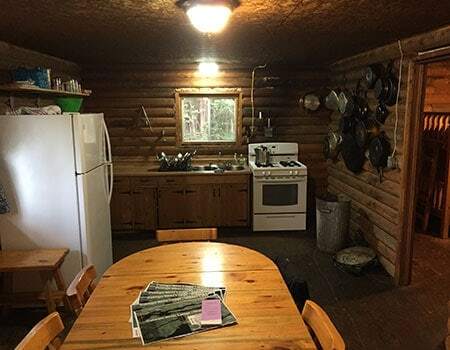 The cabin features a large, fully equipped kitchen which includes a full size, 4 burner gas cooktop with oven/broiler, a full size refrigerator/freezer, an 8 cu. ft. chest freezer, cookware, plates/bowls, cooking/eating utensils, drinking glasses/mugs, etc. For your outdoor cooking needs, there is a gas grill and a fish cooker. 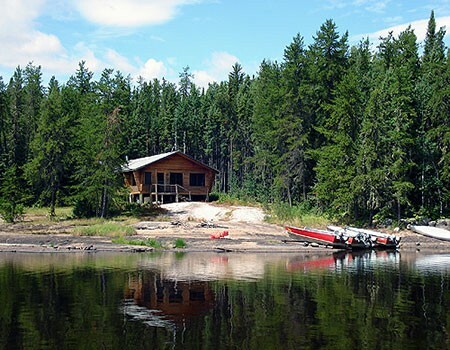 For your Canadian fishing trip comfort, the cabin is furnished with native pine dining tables and chairs plus a large living room with a sofa and a wood stove for your heating needs. 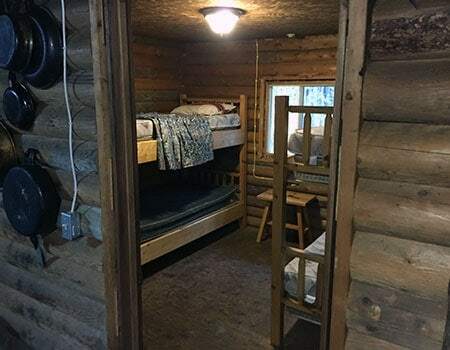 The cabin also has a hot and cold indoor shower as well as two bedrooms that contain handmade native pine bunk beds and mattresses. Attached to your spacious cabin is a 10×24 foot fully screened porch. The cabin is equipped with 110v AC lighting throughout the cabin and a gravity feed water system for your water needs. Attached to your spacious cabin is a 10×24 foot fully screened porch, and as a final touch we have installed satellite internet service. This gives you a sense of security with the ability to call for a plane in case of an emergency as well as keeping up with the happenings of family back home. Your cabin on Hidden Lake is the only cabin on a 6,400 acre lake, and your group is the only group on the lake. 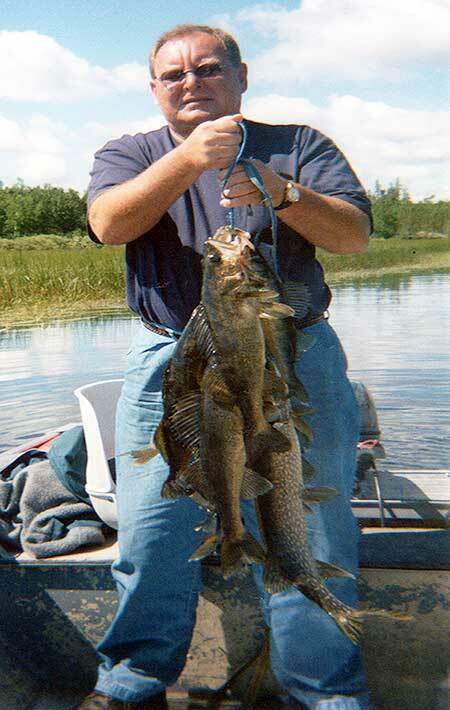 That insures your privacy and trophy fishing opportunities. The camp is equipped with S-14′ Lund boats which are the same width as 16′ Lunds and powered by 8 HP 4 stroke Yamaha outboard motors. There are enough boats at the camp to insure you are fishing only two fishermen per boat. The camp also has a 17′ canoe for the many portage trips that are available from Hidden Lake. We furnish mounted cushioned swivel boat seats with backrests, life vests, and landing nets. It’s your lake, it’s your vacation, it’s your schedule. Kick back and relax. Time to go fishing. 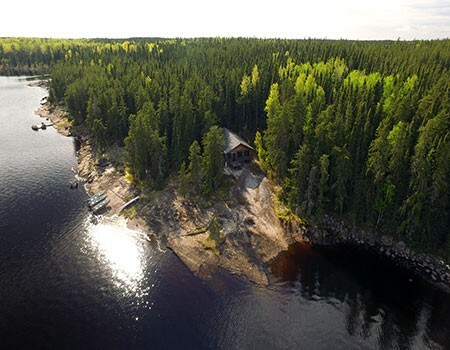 Our Canadian fly-in outpost on Hidden Lake offers you a trophy fishing experience in the secluded wilderness of Manitoba Canada on your very own private lake. 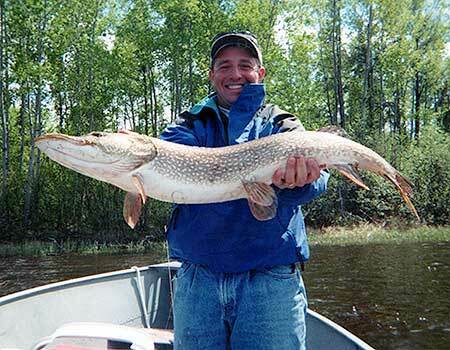 Here you can chase trophy Northern Pike and trophy Walleye all week long without any interruptions and not another fishing boat on the lake other than your groups. You will feel “Hidden” from the rest of the world as you get to concentrate on the important stuff, relaxation and fishing. 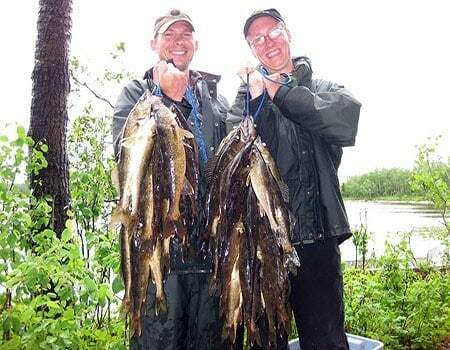 This Canadian outpost’s fishing can best be described with one word – action. 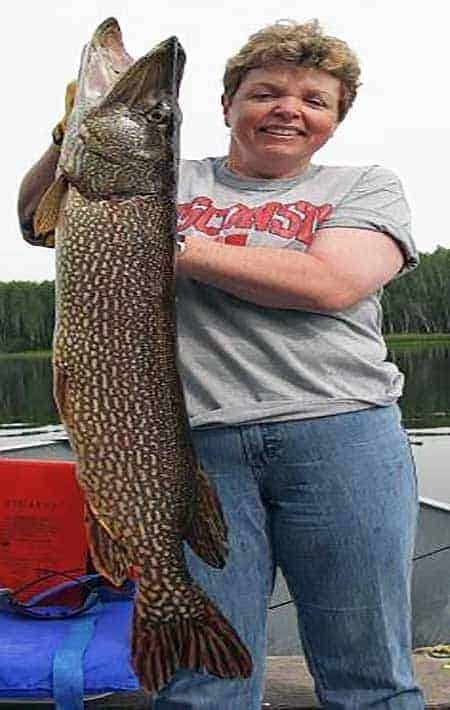 It is common for two people fishing at Hidden Lake Outpost to catch and release over 100 fish a day, with the record being 223 Walleye and Northern Pike caught in a single day. 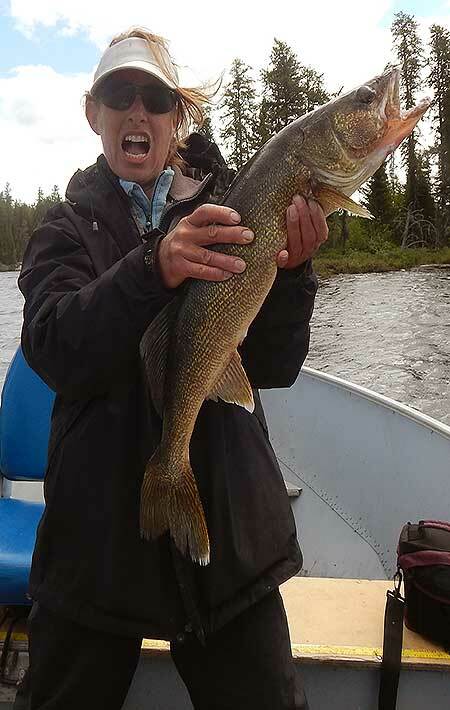 Pictures of your Canada fishing adventure will surely include large stringers of Canadian Walleye. 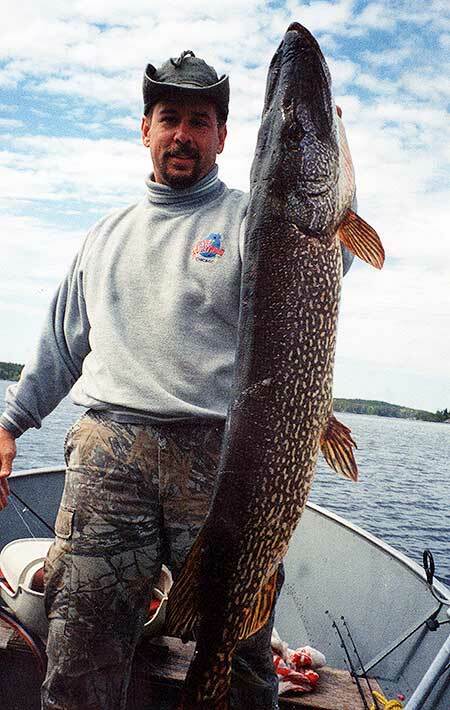 Trophy Northern Pike are also no stranger to the many cabbage weed filled bays and inlets reserved for Manitoba Canada’s lakes and rivers. 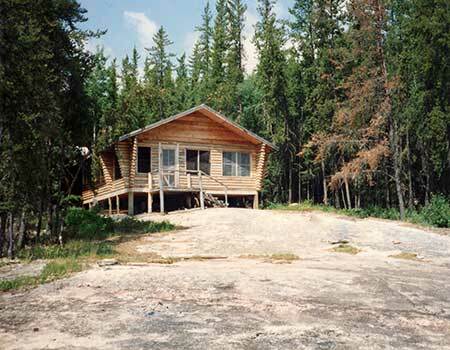 Hidden Lake Outpost is situated on a 6,400 acre lake, with a chain of islands down the center. 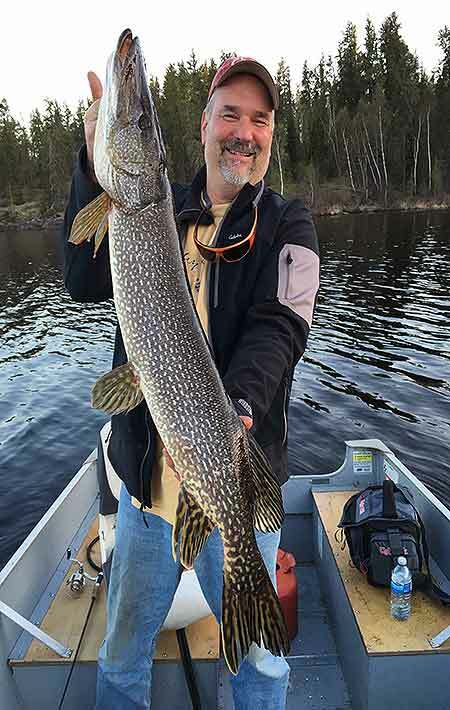 Hidden Lake’s shape and islands make fishing on windy days easy to deal with because there are always fishing spots or shorelines out of the wind. 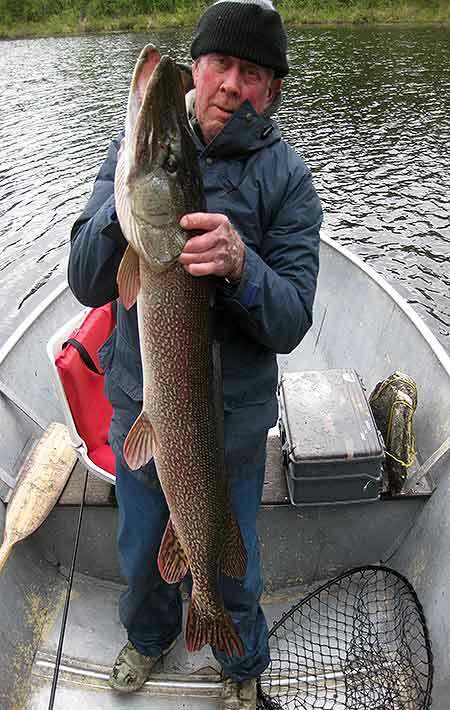 While fishing Hidden Lake you will also have access to three other lakes – Elliot Lake, Thunder Lake and Blue Walleye Lake. 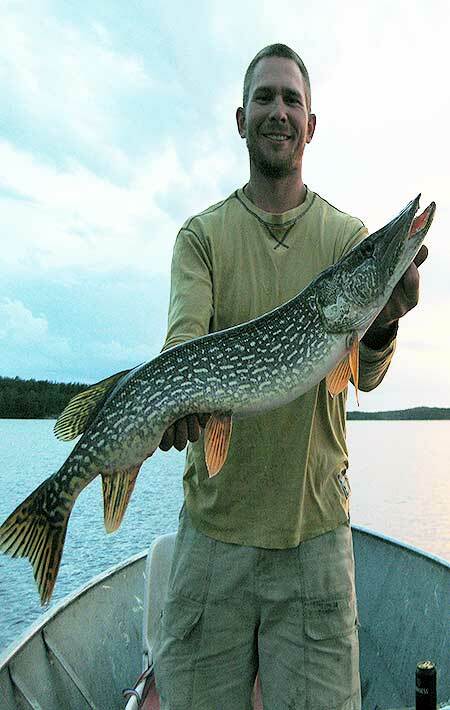 Each lake offers premier trophy fishing with unique fishing opportunities within each lake. Thunder Lake is a 25 minute ride up a channel north of Hidden Lake Outpost. 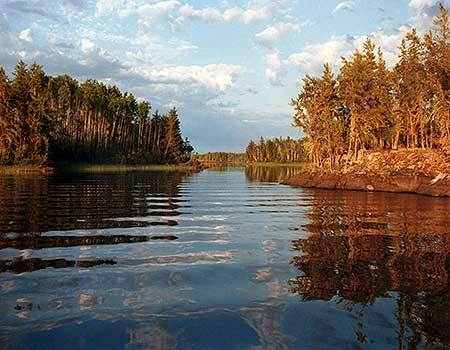 Thunder Lake’s habitat is picture perfect for trophy Northern Pike because of its wrap around bays and cabbage weed filled inlets. When you come out of the inlet, one look at the lake and you will know you have found a day full of fishing spots. 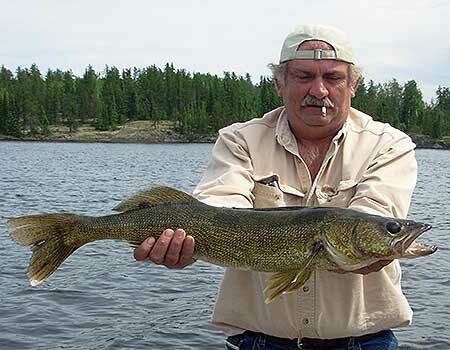 From Thunder Lake you will have access to Blue Walleye Lake. 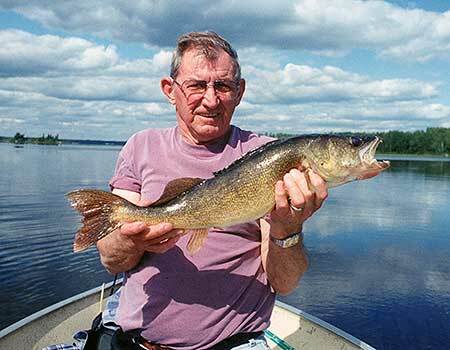 While Blue Walleye Lake is only accessible via canoe, it offers you a chance to fish for the first known Walleye species, the “Blue Pike”. 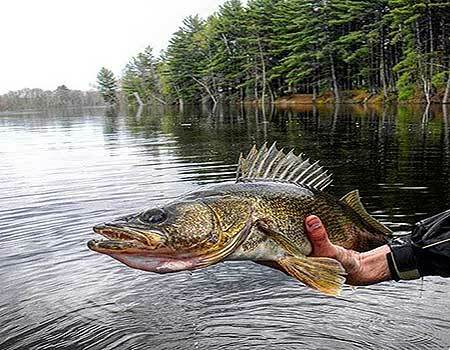 While you are required to release all Blue Pike that you catch, it is fun to see just how different the Blue Pike species are from the Walleye we all fish for today. 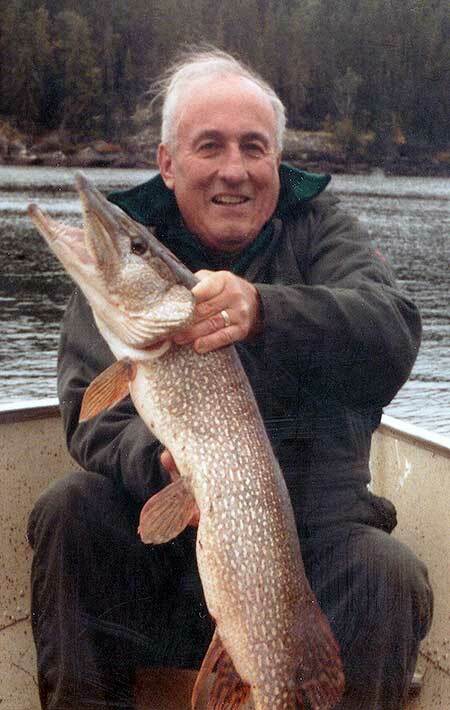 The last fishing area is Elliot Lake. 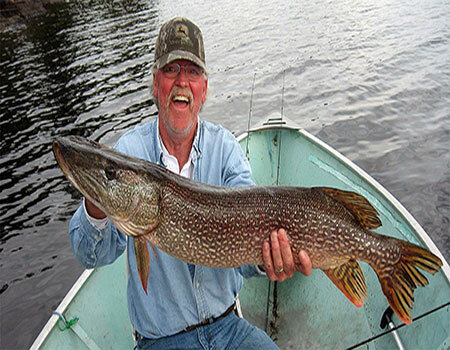 Elliot Lake has proven to be a trophy Northern Pike haven, which has produced many of the trophy Northern Pike we see at Hidden Lake. 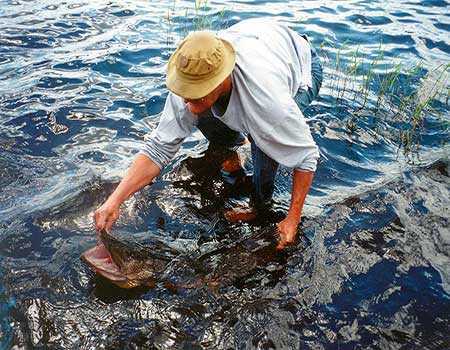 Elliot Lake is a 32,000 acre lake with an average depth of 8 feet. 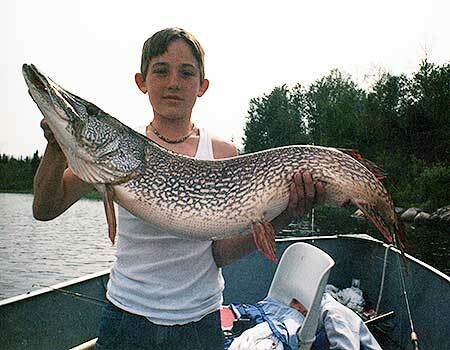 The 50+ inch Northern Pike can be found in the numerous cabbage weed beds throughout the lake. 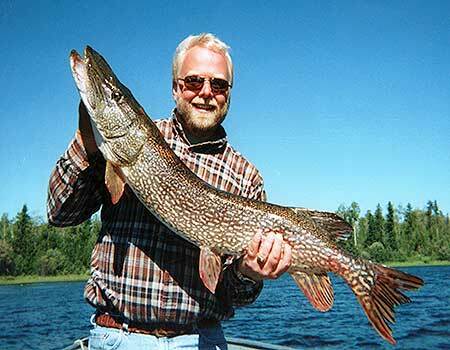 These Pike havens can be found virtually everywhere, including the middle of the lake. 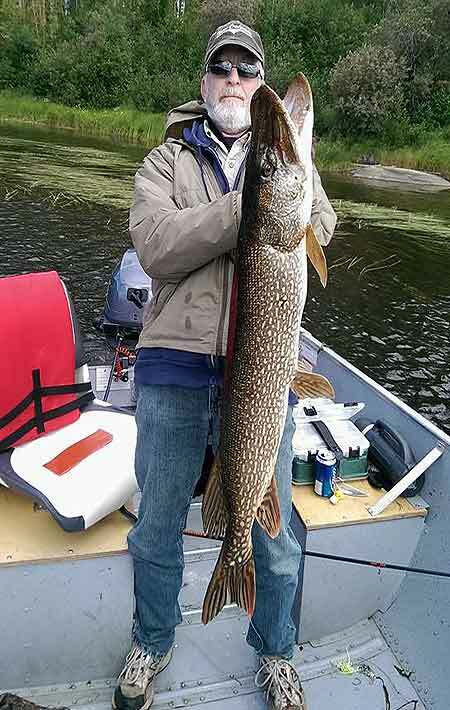 The trophy Northern Pike using these weed beds as their hunting grounds have produced many 50 inch and larger Pike over the years. 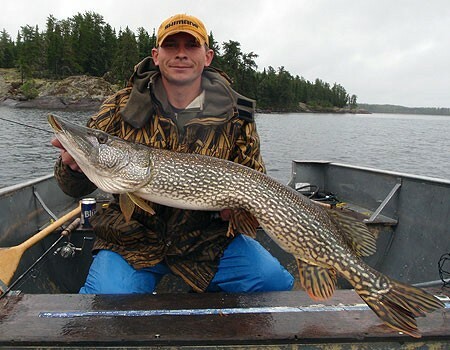 Given the abundance of bait fish and weedy bays, you will find plenty of good Walleye fishing spots on Elliot Lake if you need to give your reel’s drag a rest from the trophy Northern Pike. Rates per person, based on group size of 4 or more guests. Groups of 2 add $250.00 per person, Groups of 3 add $150.00 per person. Fully equipped 14 foot Lund S-wide body boat with Yamaha 4-stroke outboard, gas, backrest seats, landing nets, and life vests. 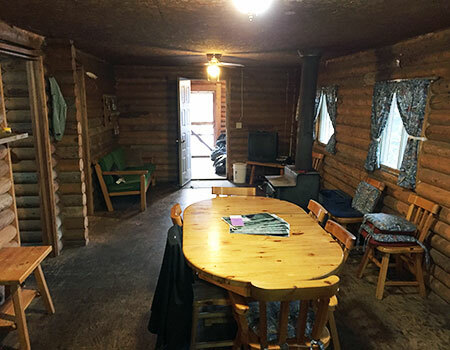 Fully furnished cabin including bed linens and towels. Wireless internet throughout the property. Full kitchen, all utensils, barbecue grill, and fish cooker. Your own private lake, no other guests or cabins on the lake. Airport shuttle from Winnipeg International to departure base. Order your groceries to be at your cabin upon your arrival. 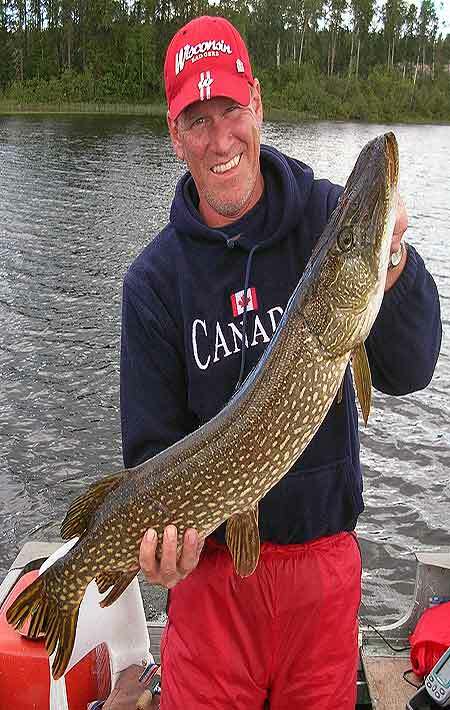 Bissett gets you into the heart of Canada on some of the most pristine lakes the world has to offer at the best value. Bissett is a 3 hour drive from Winnipeg. 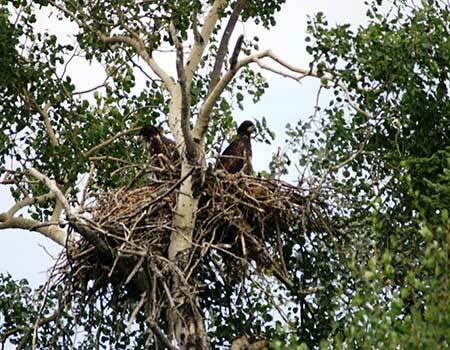 Guests will plan to arrive the night before and stay at Northern Wings Bed and Breakfast. 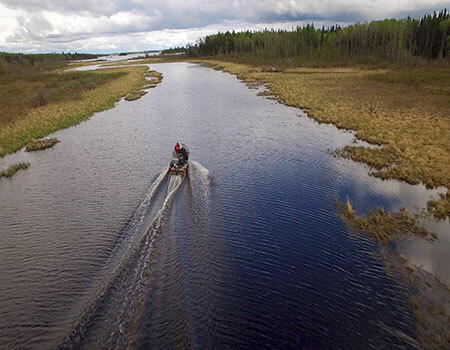 Guests will arrive the night before their departure and have an early morning departure on day 1 of their trip, which will still get you on the water by 8 am at the lodge (weather permitting). St. Andrews is a quick 35 minute drive from Winnipeg. Guests have many options from fine dining to local favorites, along with a wide range of hotels to choose from. Check out our Useful Destinations page for more information on Winnipeg choices. Add 400.00 per person for Winnipeg departure. Includes airport transfers from Winnipeg International. Rates do not include applicable taxes and fees, tips, and beverages. We accept Cash, Check, Visa, MasterCard, and PayPal.